Inky Dream: What's Black and White and Fits Four Challenges? This is my first attempt at negative stamping. This is where I say "and it won't be my last time", but I keep seeing so many different techniques that I'm looking forward to trying, who knows when I'll get back to it. Really, some of you out there do such amazing work! 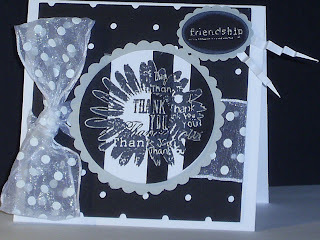 Stampin' for the Weekend asks for monochromatic. Lovely card, great ribbon! Thanks for joining in at Cupcake! This is really a great card. Great job on this one.